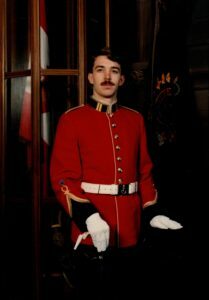 I officially began my service with the Canadian Forces in July 1991 at the age of 18, almost immediately after graduation from high school. 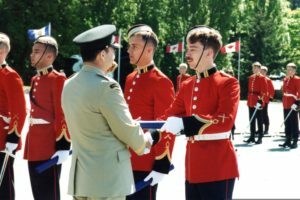 The first summer saw basic training in Chilliwack, BC followed by two weeks of recruit term at Royal Roads Military College. Although not quite as over the top as one sees in movies, the two weeks of recruit term at RRMC was physically and mentally challenging. From early morning reveille until last post and lights out, virtually every second of your day was planned, directed, monitored, and critiqued. Attending un iversity at RRMC was a unique experience. A fully accredited university, we were taught by a combination of civilian and military professors. In addition to a regular undergraduate academic workload, we also had second language training, physical fitness training, and mandatory intramural sports. One weekend a month was devoted to a College sports activity, and a second weekend each month was devoted to drill practice and parade. As a first year student, regular room and dress inspections were the norm. Depending on how closely you adhered to college rules, you would also spend time completing punishments such as running laps in the morning or doing evening drill practice. Being a relatively small university, I made stronger lifelong friendships with many of my RRMC classmates than at any other point in my life. RRMC was also where I met my wife, Sheri, who was a year behind me at school. I graduated from RRMC in 1995 on the Dean’s List with a Bachelor of Arts Degree in History and International Politics. At the graduation ceremony I was honoured to receive an award for the highest marks in History, Politics, and Economics. The end of the school year was a time of conflicting emotions. Graduation brought relief and joy that I had succeeded at the academic challenges of the college. Just a week after the graduation ceremonies we conducted another ceremony, this one to close RRMC as a Canadian Forces installation (it was one of the many military bases closed by the Chretien Liberals in the mid 1990s.) It has since reopened as a civilian institution, but obviously it is not nearly the same atmosphere that I attended years ago. 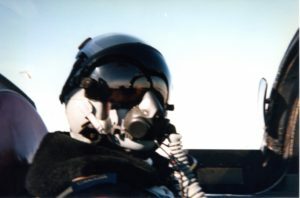 After leaving RRMC, I started my basic jet training at the “Big 2”, 2 Canadian Forces Flight Training School in Moose Jaw SK. Although the Tutor jet was fun to fly, I quickly found that the extended separation from Sheri was not to my liking. Considering she was a Logistics Officer in the Army, I quickly came to the conclusion the best chance of us being posted together would come if I chose to fly helicopters. 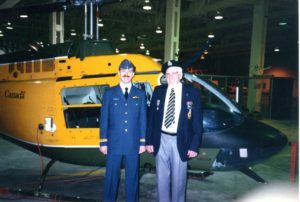 Upon graduation from Moose Jaw, I was transferred to 3 Canadian Forces Flying Training School in Portage La Prairie, MB to conduct basic helicopter training. The highlight of Portage was upon graduation, we would receive our pilot’s wings. At the graduation ceremony, my Grandpa Joe was able to come on parade and be the one to pin the wings on my chest for the first time, a memorable experience for both of us. Grandpa Joe and I at my Wings ceremony. By this time, Sheri had completed her training and had been posted to CFB Edmonton. In addition to receiving my Wings, graduation from the helicopter school came with a posting to my first operational unit. Unfortunately, at the time there were no vacancies at the helicopter squadron in Edmonton. However, I was able to get a posting to the helicopter squadron in Cold Lake where I was to fly the CH-146 Griffon helicopter.